Nelson Rolihlahla Mandela - our Nation's Father. Rest in peace! I was privileged to have met Pres. 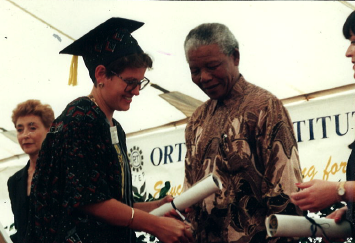 Nelson Mandela in person, on the 7th May 1996 when I graduated from the ORT-STEP Institute as one of the first group of Technology Education teachers in South Africa. We were honoured to have Pres. Nelson Mandela, as our guest speaker. In preceding days we had been told to prepare questions we could ask Pres. Mandela, as we would have time to spend with him and have a group discussion for about half an hour. However on the morning of ceremony, we were told that the arrangements had all changed. Pres. Mandela was flying back from Mozambique, he was on his way to Cape Town as there was a "crisis" with the constitution discussion, where he was needed urgently. Pres. Mandela had said that he would not miss our graduation as he felt that teachers were the cornerstone of our new democracy, and he had said he would attend the ceremony. Consequently the programme was completely rearranged, so that Madiba could award us of our certificates and get to Cape Town as soon as possible. My parents, husband and my daughters attended the ceremony with me; we were very excited about seeing Pres. Mandela. My girls were very little, but still speak about that day. It was an honour to meet the man in person. My most vivid memory of the morning was when I actually went onto the stage and shook Pres. Mandela's hand. I was so overwhelmed and inspired as he greeted me. When I walked up to him and shook his hand, he commented, "Do I greet you in English or Afrikaans?" - "English", I said. "Do you know that Walstra is a Dutch name? That '-stra' means 'family'! And he smiled! He then said, "Congratulations on your achievements, thank you for being a teacher". It was so wonderful to share, just those few words, with an amazing gentleman! The graduate before me he had greeted in isiZulu and the person behind me he greeted in seSotho, saying a few private words to each of us in turn! What an amazing example he set for all of us. As teachers his message to us on that day was one of hope and inspiration. He noted that "the foundation stone on which we must build to address this problem is the training of teachers in technology education. Each teacher will, in turn, train hundreds more students. Such teachers will also help bring about change in attitude towards the place of technology in our education system. They will give a lead in enabling us to solve today`s problems with today's tools." What a privilege is was to meet Pres. Nelson Mandela in person! The Pres. Mandela quotes that inspire me, as a teacher to be committed, accountable and dedicated as I teach. As teachers, we should take ownership of our profession and live up to the aspirations Madiba had for every teacher. "Education is the most powerful weapon which you can to change the world." As teachers we should be inspired to take ownership of the role we play in society! Encourage all children to achieve the best they can in as they progress through school, and into further education and their careers. As teachers we should ensure that every child we teach is given every possible chance to reach her / his full potential - we are key as teachers. As teachers we should set the example and be the role-model that learners and members of society can look up to. Many blessings and deepest sympathy to Pres. Nelson Rolihlahla Mandela's whole family, on the passing of their loving husband, father, grandfather, brother, and an inspirational world icon! Rest in peace, Tata, Pres. Nelson Rolihlahla Mandela! Thank you for uniting our country! Thank you for the legacy you have left us, as all South Africans and the world as a whole!